This is a Chinese name; the family name is Gu. Gu Kaizhi (simplified Chinese: 顾恺之; traditional Chinese: 顧愷之; pinyin: Gù Kǎizhī; Wade–Giles: Ku K'ai-chih; c. 344–406), courtesy name Changkang (長康), was a celebrated painter of ancient China. He was born in Wuxi and first painted at Nanjing in 364. In 366, he became an officer (Da Sima Canjun, 大司馬參軍). Later he was promoted to royal officer (Sanji Changshi, 散騎常侍). He was also a talented poet and calligrapher. He wrote three books about painting theory: On Painting (畫論), Introduction of Famous Paintings of Wei and Jin Dynasties (魏晉勝流畫贊) and Painting Yuntai Mountain (畫雲台山記). He wrote: "In figure paintings the clothes and the appearances were not very important. The eyes were the spirit and the decisive factor." Gu's art is known today through copies of several silk handscroll paintings attributed to him. Gu Kaizhi was born in Wuxi (in modern Jiangsu) where his father served in the imperial secretariat as an assistant. At about nineteen he was employed as aide to the Grand Marshal Huan Wen. He held a succession of minor official posts under various leaders of the Eastern Jin court. One emperor under whom Gu Kaizhi served was Huan Xuan. An enthusiastic art collector, ahead of his accession Huan Xuan ordered a big boat to store paintings and other treasures so that they could be easily transported to safety in case of war. Gu Kaizhi entrusted to the emperor a sealed chest with his most precious works. The emperor broke open the box, stole the paintings, then repaired and returned it to the artist with the seals intact. 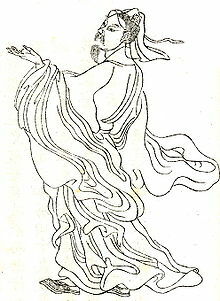 Upon discovering his loss, Gu Kaizhi said that, "the marvelous works partook of divine power, transformed themselves and vanished, like men ascending to join the immortals." This painting, dated between the 6th and 8th century AD - probably an early Tang Dynasty copy - illustrates nine stories from a political satire about Empress Jia Nanfeng written by Zhang Hua (ca. 232-302). Beginning in the eighth century, many collectors and emperors left seals, poems, and comments on the scroll. The Admonitions scroll was stored in the emperor's treasure until it was looted by the British army in the Boxer Uprising in 1900. Now it is in the British Museum collection, missing the first three scenes. There is another surviving copy of this painting, made during the Song Dynasty and is now held in the Palace Museum in Beijing. The Song version is complete in twelve scenes. The painting is on silk and is a polychrome. "The figures, whose countenances are at once solemn and tranquil, are described with a thin, unmodulated brush-line.... The brush-mode...has been described as 'spring silkworms spitting silk'". Take a good look at the way the clothing is painted and you will see the exquisite variety and detail employed by the artist. Nymph of the Luo River is a painting by Gu which illustrates a poem written by Cao Zhi (192-232). It survives in three copies dating to the Song Dynasty. One copy is now held in the Palace Museum in Beijing, and another one is now at the Freer Gallery in Washington, D.C. The third was brought to Manchuria by the last emperor Pu Yi (1906–1967) while he was the puppet emperor of Manchukuo under Japanese rule. When the Japanese surrendered in 1945 the painting disappeared. After ten years the Liaoning Province Museum recovered it. The Palace Museum copy of the Nymph of the Luo River, Southern Song. The Freer Gallery of Art copy of the Nymph of the Luo River, Southern Song. A section of the Liaoning Provincial Museum copy of the Nymph of the Luo River, Southern Song. Wise and Benevolent Women survives in a 13th-century copy dating to the Song Dynasty, and is today located in the Palace Museum in Beijing. It illustrates a subset of the women described in the Han dynasty work Biographies of Exemplary Women. The 5 meter long scroll is divided into 10 sections, with each section containing a short description. The 13th century Palace Museum copy of the Wise and Benevolent Women, full painting. ^ a b c Cihai: Page 1846. ^ a b Sullivan (1962). The Birth of Landscape Painting in China. University of California Press. p. 90. GGKEY:APYE9RBQ0TH. ^ Wu Hung (1996). The double screen: medium and representation in Chinese painting. University of Chicago Press. p. 167. ISBN 0-226-36074-1. Ci hai bian ji wei yuan hui (辞海编辑委员会）. Ci hai （辞海）. Shanghai: Shanghai ci shu chu ban she （上海辞书出版社）, 1979. Wikimedia Commons has media related to Gu Kaizhi. This page was last edited on 13 March 2019, at 12:54 (UTC).